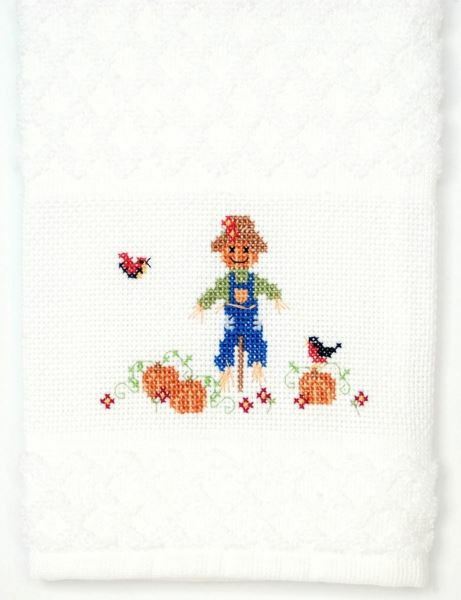 I adore this happy little scarecrow. It will look so pretty in your bathroom – up where no one can use it! When you put your heart into stitching this little guy you’re probably not going to want little hands touching him. But if you like to live dangerously, you can set it out to be used. I adapted it from www.leschroniquesdefrimousse.com. 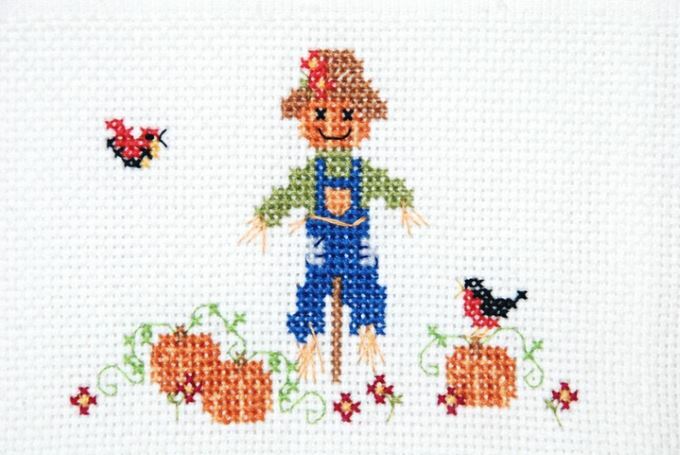 Before I learned how to cross stitch I remember thinking it would be way too complicated for me. It looked too intricate and delicate. I only knew how to sew, not do fancy stitches. 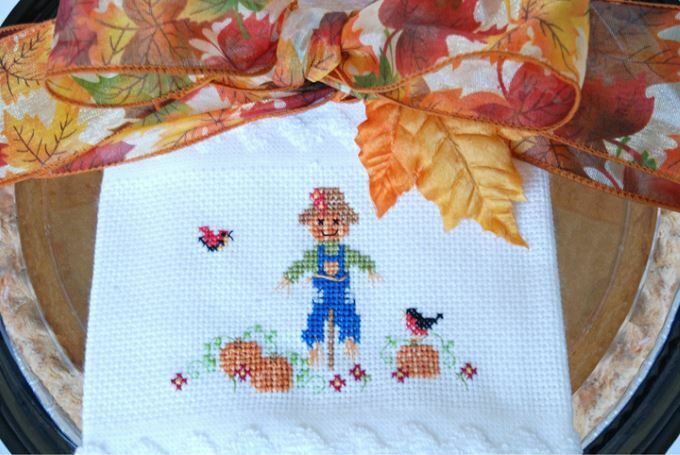 Cross stitch uses a special fabric that is woven in such a way that you see a “square” marked by four dots in each corner. You connect the dots with single stitches to make an X – super easy. Plus, there is a pattern chart that shows you exactly where to put each stitch and what color it should be. If you’re a guest at a Thanksgiving dinner, this towel would be a really special thank you gift. It would be nice tied with a pretty ribbon on a bag of artisan bread or a pie. If the host woke up early and prepared multiple dishes for Thanksgiving dinner she’s absolutely deserving of this towel. She probably would prefer it was tied to a bottle of her favorite wine, maybe even a box of wine, all right, a case. But hey, you pick the gift. If you’re a beginner and this is your first attempt at cross stitching, just buy your own deserving gift for when it’s done. Here are the supplies you’ll need and all can be either found at Walmart or ordered through their site to store. Towel: Not all cross stitch towels are created equal. This diamond weave by Charles Craft is in a class above. The bottom is hemmed unlike some velour towels where the strands hang down. Also the terry part of the towel has a nice diamond weave pattern on it. It’s a bright white. You’ll most likely need to order this “site to store” (order it on the Web site and have it sent to the local store in your area). The Walmart I visited with a fabric department didn’t keep it in stock. Another thing I love about these towels is that the label has a pretty cross stitch pattern of a bird inside. Here are two from my towels. Needle: I happen to like size 22 for my tapestry needles but there are other sizes that would work fine. It just has to have a blunt tip and a big eye. 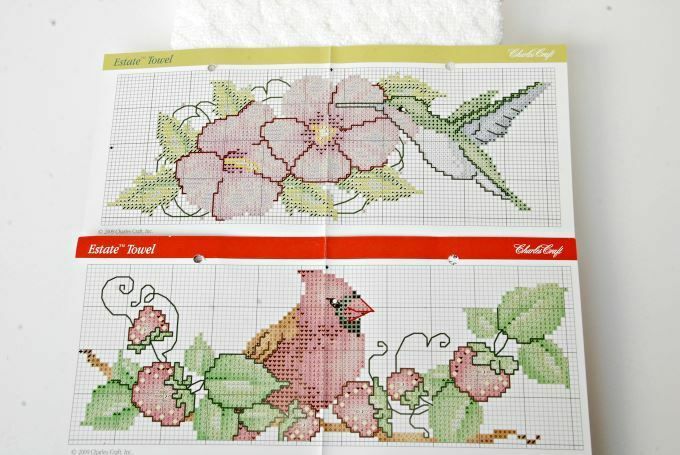 Floss: With any cross stitch you can either follow the colors suggested on the chart or choose your own. Maybe yours is a girl scarecrow and she’s wearing pink overalls. You should love the colors you sew with so feel free to change them. Hoop: Using a hoop to hold your fabric taut is a personal preference so I’ll leave that up to you. Here’s the detailed information you’ll need to make it. Cross stitching this towel went pretty quickly. Changing colors is what takes the most time. My kids kept checking in to see how he was coming along and agreed that he was adorable. I hope you take the time to stitch him and that he makes you smile. 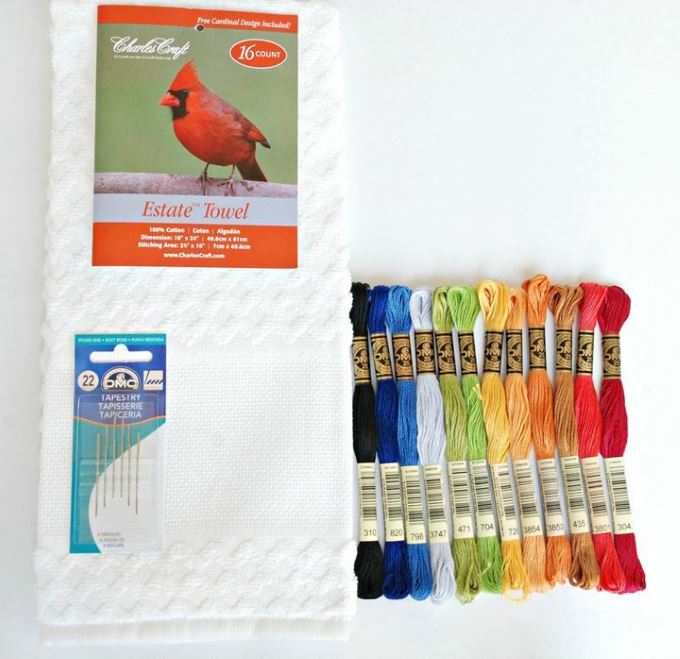 Where can i find the charles craft estate towel with the Cardinal shown above? I did the Oriole pattern and am looking for the Cardinal or Blue bird or Blue Jay. Would love if I could find it. I looked on Walmart’s website and see they only carry the Oriole right now. I think they change the birds periodically – so I’d check Walmart’s site in a few months to see if they have a new style. Another idea is to contact Charles Craft and see if they could help (charlescraftinc.com). I hope you can find both of them. I’m glad to hear you think they’re beautiful too. Best wishes. Hey Jennifer .. is there any way you can send me the cardinal pattern to my e mail ?! I love cardinals and been looking for that pattern. I just sent you a link to the pattern. Thanks so much for reaching out to me.